Habesha Entertainment is a site where you can find unique Entertainment topics, Videos, Pictures, News, Places of Ethiopia, Technology, Life and Health Tips. Dire Tube is the largest video sharing site in Ethiopia. It was started on 2008 and grow very fast to rank number 1 Ethiopian Entertainment site on alexa. It includes videos on Ethiopian Amharic movies, Amharic drama, Amharic music and articles on latest Ethiopian news. Is also one of the largest Ethiopian video sharing sites on the internet. Besides the well known Ethiopian Amharic dramas, movies and musics. This site has its own unique videos including shows, dramas and etc.. It is a site for latest Ethiopian news, Amharic movies, music, and drama. This amazing and popular website has a large collection of Ethiopian Amharic movies, and dramas including Mogachoch, Dana, Nuroachin, Sew le Sew Ethiopian Drama, Ethiopian movies and trailers. A site where you can find Ethiopian Breaking News, comedy, music, movies, interviews and shows. Sodere is a blog and a video sharing site which was started on 2010. It has around 40,000 email subscribers and 300,000 monthly visitors which makes it one of the largest entertainment sites in Ethiopia. Sodere has blog posts, and videos including amharic dramas, music, and movies. The movies in this site are legally included with partnership with Selam Production. The official site of EBC. It has latest Ethiopian news, music, drama, events and shows with categories. 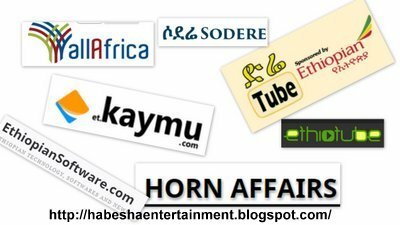 Horn Affairs got Ethiopian news on different topics including Ethiopia, Eritrea, Grand Ethiopian Renaissance Dam, Railway construction in Ethiopia and many more. Horn Affairs presents Ethiopian News in English, Amharic, Afan Oromo, and Tigrigna languages. Addis Today comments on new Ethiopian news topics. Gathering its topics from different governmental and nongovernmental websites. Ezega news provides its customers with the latest national and international news topics for Ethiopians who live in their country or abroad. Like the other sites Ethio Media gives us interesting and latest Ethiopian news in Amharic daily. Sheger tribune provides news and interviews on hot and important topics for us. This site also has Amharic musics with a unique playlist and audio player and movies. In this very popular news site you can get latest news articles on entertainment, business, environment, health, sport and travel. Nazret Ethiopian news delivers articles on latest news on shopping, travel, sport and many more. It also has radio, link directory and forums. Is the best online market place for you guys if you are living in Ethiopia. Kaymu Ethiopia is the best shopping place for jewelries, computers, laptops, fashion clothes, shoes, sporting goods, and more. All you have to do is order what you wanted and you will get a call from kaymu workers and you can finish the rest on the phone. Addis Ababa University which was formerly known as University college of Addis was founded in 1950. It is the first and the largest university in Ethiopia. Addis Ababa university has 6 campus in Addis Ababa, Ethiopia. Jimma University is a public university which was founded in 1952. It is located in Jimma, Ethiopia. Gondar University is a public university which was founded in 1954. It is located in Gondar, Ethiopia. Adama University is a public university which was founded in 1993 as a college and grow to become university in 2005. It is located in Adama, Asella, Ethiopia. Bahir Dar University is a public university which was founded in 2001. It is located in Bahir Dar, Ethiopia. Haramaya University is a public university which was founded in 1954. It is located in Haramaya, Ethiopia. Hawassa University is a public university which was founded in 1999. It is located in Hawassa, Ethiopia. It is a public university which was founded in 1986 and it is located in Arbaminch, Ethiopia. Currently it has around 20,000 students. Debre Berhan University is a public university which was founded in 2007. It is located in Debre Berhan, Ethiopia. Dire Dawa University is a public university which was founded in 2011. It is located in Dire Dawa, Ethiopia. Jijiga University is a public university which was founded in 2005. It is located in Jijiga, Ethiopia.